Ravi Chaudhry is the Founder Chairman of CeNext Consulting & Investment Pvt Ltd, a New Delhi based strategy consulting firm, established in 1995. He is a mechanical engineer and specializes in evolving and implementing India business strategies, and “Strategy Audit and Re-alignment” to bridge the gap between ‘what is’ and ‘what can be’. An astute observer of the emerging global complexities, trends and risks, he blends information, knowledge and wisdom to create innovative leadership modules such as ‘Re-inventing Leadership to Cope with Future’, and ‘Mindfulness – the trait that bridges the gap between Achievement and Potential’. His clients include several Fortune 1000 corporations, including BASF and BMW (Germany), DHV (Holland), Sunstar (Japan), Sabanci (Turkey), Domino Sciences (U.K.), Perfetti (Italy), numerous Indian business groups, and many others. He has been an advisor to Governments of Switzerland, Turkey, Brazil and Norway, and has done many assignments for multilateral organizations (UNIDO and World Bank), think-tanks and universities, as well as Governments of Austria, Argentina, Canada, Germany, the Netherlands and Uganda. 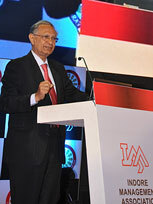 He has addressed numerous conferences and interactive CEO Dialogues on “Investment and Growth Strategies for Emerging Markets”, and lectured in over twenty five countries on “What Foreign Businessmen need to know about Business in India”. He is a Fellow of the World Business Academy, a network of global thought leaders that represent some of the best and brightest men and women shaping today's landscape. 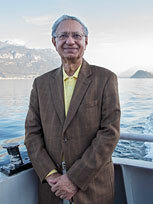 He has served on the boards of several companies and organizations. He is International Board Director, Future 500 USA; Member, Advisory Board of Ethical Markets USA, Co-Chair, EthicMark® Judges Panel USA; Member, EVIAN Brains Trust at IMD Switzerland; New Civilization Youth Entrepreneurship Initiative, Japan and Executive Committee of Federation of Indian Chambers of Commerce and Industry. 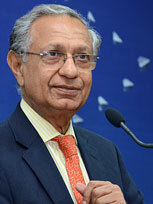 Prior to that, he was Chairman of four companies in the Tata Group, India. His book, Quest for Exceptional Leadership has been globally acclaimed as “the best book on leadership in years and a rare combination of sound business thinking and accessible philosophy.” He makes a compelling case that business and community leaders need to re-align themselves with the new ground realities, now. He deftly outlines the emergence of a new fifth phase of human enterprise, redefining the criteria of success and re-configuring the routes to success. He analyzes the base camp traits of leaders today and vividly portrays the journey to the summit of leadership, while providing a down-to-earth, realistic blueprint to acquire the three key attributes of effective CEOs of the future. The best handbook for corporate executives in years. A wise and practical book, a journey from base camp to the summit of leadership. Business leaders will find it ‘a gentle guide’ and a source of conviction that we need a new paradigm of leadership. Very inspiring and very thought provoking! Thoughts and knowledge collected over a lifetime have been condensed in very clear concepts that can be used in a very practical way by anyone in a leadership position in any organization. Business objectives and society’s needs tend to be like the two tracks of a railway line. Looking ahead, they appear to converge in the distance; in reality, they never do. This is no longer sustainable. The only choice is: accept the new reality grudgingly or willingly. The crunch question is: if you seek only shareholder value and wealth, then these thoughts are not pertinent. But if you are looking for sustainable wealth and sustainable happiness, for you and all others around you, then these concepts are relevant, remembering that ‘Life is not a matter of "having more", but ‘being’ more.’ That is why we are called Human Beings, not Human Havings! Like a novel with two possible endings, our story for this century is yet to be written. There is nothing inevitable about our success or failure. More than one may admit, the future is a matter of human choice, not mere prediction. What are the possible right choices? Will we make the right choices?” Will these choices lead to sustainable outcomes for us, our business, our country and our planet? Ravi Chaudhry has addressed major global conferences as keynote speaker, session chairman, panel moderator as well as lead discussant. He has conducted on-stage interviews with several business leaders and thought leaders, and has also been interviewed by many of them (including at IMD Lausanne and Conference Board USA events). He has singly conducted several board and senior management corporate programmes, on themes such as “Aligning corporate objectives with individual goals and societal expectations”. These single-faculty programmes typically last half-day to full–day. Equally often, these are spread over a two-day retreat, often followed by a one-to-one meeting with each participant, a week or two later. Ravi is also a frequent invitee to corporate strategy retreats, where he makes the opening comments on the current state of the global economy, and then concludes with his observations on the matrix of options in the years ahead. Why Leaders today do not inspire trust and how Global Elite can be made a driver in this process of change? The thoughts, insights and views you have shared with us have really made a strong impact. They will be guiding us in our process of defining our regional strategies. We would feel honoured if you were to further accompany us on this journey. 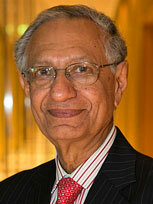 Mr Chaudhry seeks to change the world by transforming business leaders. Don Quixote didn’t manage to change the world but the world would be poorer if people like him didn’t try. He is very inspiring. I love the fact that he is sounding a call for individual responsibility (of the CEO). He gives a learned and incredibly imaginative guidance for top leadership. He speaks a new language for socially responsible behaviour and shows that social responsibilities are not limited to those at the top, but rather that social responsibilities can take anybody to the top.